Why Go to Yellowknife to see the Northern Lights? When people think of places where they can see the Northern Lights, they usually think of Norway, Sweden, Finland or Iceland. Not as many people think of going to Canada to see the Northern Lights! However, Yellowknife is one of the best places in the world to see the Northern Lights due to its northern latitude and high amount of clear dark nights! According to the Aurora Village website, the Northern Lights are visible around 240 nights per year. 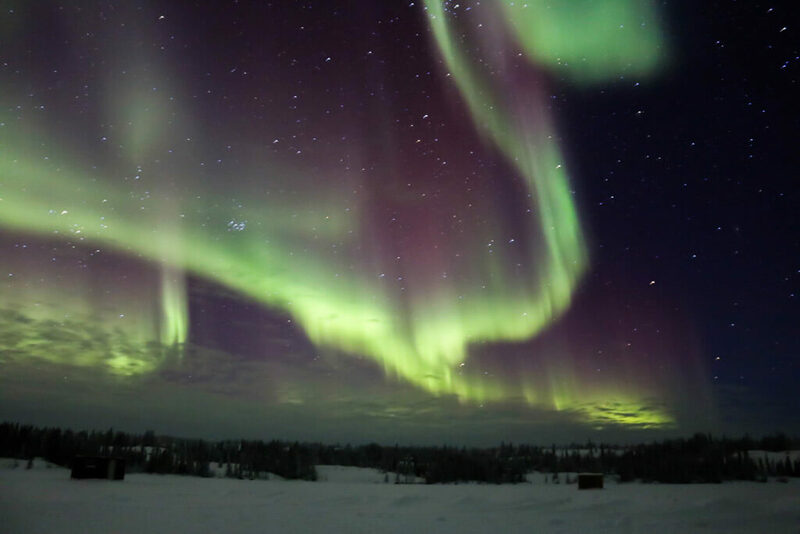 Yellowknife has been a very popular aurora hunting destination among Japanese tourists for many years and is now beginning to see an increase of tourists from other countries. I had never thought of Yellowknife as a tourist destination until one day when I was scrolling through my Facebook feed and saw a classmate’s photos of the Northern Lights in Yellowknife. I was immediately intrigued and started researching the destination. A few days later, I booked a four night trip there for the end of January/early February. When is the Best Time to See the Northern Lights in Yellowknife? Daily flights are available from Vancouver, Edmonton, and Calgary. How Can I See the Northern Lights in Yellowknife? In Yellowknife, there are three main ways to see the Northern Lights. Aurora Village is the most popular choice among tourists who visit Yellowknife. Located in the wilderness about a 40-minute drive from Yellowknife, it is famous for its traditional teepees where visitors can take shelter while waiting for the lights to appear. We booked two nights of aurora viewing at Aurora Village. On the first night, we were picked up at our hotel by a large bus. On the bus, there were three guides: one who spoke Japanese, one who spoke Chinese and one who spoke English. They each gave an explanation about what would happen once we arrived at the village. The vast majority of the tourists on the bus were Japanese. Once we arrived at the village, we were sorted into groups by language and assigned to teepees. All the English-speaking people (less than 20) were assigned to one teepee. Our guide, who was from Japan, gave us a tour of Aurora Village, showing us the restaurant, gift shop, washrooms, and the best aurora viewing spots. When we got back to the teepee, the guide explained how to use the hot chocolate machine and the warm wood-burning stove. There were several tables with chairs to sit on. After enjoying some hot chocolate, we decided to explore the Village. The sight of the glowing teepees against the dark sky was very beautiful. Some Japanese tourists were sitting outside in lawn chairs, gazing up at the sky. Unfortunately, the sky was very cloudy and there was no sign of the aurora. It was very cold (below -20C) so we went inside the teepee to sit down and have some hot chocolate. We spent the next few hours sipping hot chocolate and intermittently going outside to check the sky, but the aurora did not appear. The guide said that since it was too cloudy for the aurora to show up that night, the photographer would take a free photo by the teepees for anyone who wanted one. Usually, you would have to pay extra for any photos taken by the Village photographer. Around 12:45 am, it was time to get on the bus and head back to Yellowknife. A couple of hours prior, the guide had offered guests the option of purchasing an extension to stay longer, but no one from the English speaking group chose to do so. A group of Japanese did, though. They were still sitting in their lawn chairs, bundled up in their thick coats and snow pants, staring at the sky when we left. It is amazing that they could endure the cold for so long! The next night at Aurora Village was very similar to the first- a lot of sitting around in the teepee drinking hot chocolate and hoping that the aurora would come out. Unfortunately, it was way too cloudy to see them. I think that Aurora Village is a beautiful place to photograph the Northern Lights because of the teepees. Because of the glowing teepees and the pure white snow, it also has a very romantic atmosphere. As well, it has clean washrooms and warm shelters. However, if the lights do not come out, you will probably feel very bored there. I think Aurora Village can improve by providing some complimentary baked treats (like cookies or muffins) for visitors in the teepees. There is a restaurant at Aurora Village, but it is rather pricey. I also think that a postcard or small magnet should be offered to visitors who did not see the Northern Lights. If you need to find things to do in Yellowknife during the daytime, Aurora Village has lots of fun winter activities. Another way to see the Northern Lights in Yellowknife is to book an aurora chasing tour. This means that a tour guide drives you and a small group of people to different locations outside the city to search for the lights. For our third and fourth nights, we booked an aurora chasing tour with Aurora Ninja Photo Tour because of their excellent reviews on TripAdvisor. On the third night, we were picked up at our hotel by Wynne, one of the owners of Aurora Ninja Photo Tour. She was driving a black van with a cute ninja character logo on it. We were driven out of the city to a forested area where Wynne parked the van. Already, we could see some aurora dancing in the sky! I set up my tripod and Wynne helped me adjust my camera settings. After a few minutes David, her husband, arrived in another van. He was driving a large family of 8 people. The aurora faded away after some time so David and Wynne decided to take us to another location to look for more lights. They found a place where the Northern Lights was strong. David took photos of us with the aurora in the background. We also set a timer on our camera and took pictures of ourselves. Later, the Northern Lights disappeared and Wynne drove us around looking for more. Since it had become cloudier, we stopped somewhere and Wynne gave us delicious congee and hot chocolate! On the fourth night, the Northern Lights were very strong! It was just the two of us in the van again with Wynne and the same family in the other van with David. We stopped at several locations. One of my favourites was at Great Slave Lake near town- there were several boats on the snow which made great foreground for photos. It was -30C and my fingers were trembling, even inside my gloves, from cold and excitement but I still managed to get some nice photos. Since it was so cold we took breaks inside the van to sip hot chocolate. This time, we were served hot dogs. Later we were taken to another lake surrounded by forest. David set up his camera and was taken some time lapse shots. The aurora was dancing and pulsing in the sky like moving curtains, surrounded by many stars. It was truly an amazing feeling to stand there and watch the aurora. It was just so beautiful! Overall, I highly recommend the Aurora Ninja Photo Tour with David and Wynne! It was great having aurora photography experts around to ask for advice on camera settings. Even though it was so cold, they both had so much energy and were not afraid to come out of the van and chat about the aurora or help with camera settings. The congee and hot dogs were also very much appreciated. We were even given a small souvenir. On my second night with them, I rented boots from Wynne because my own were not warm enough. Personally, I enjoyed the Aurora Ninja Photo Tour more than my experience at Aurora Village because we were able to move around to different locations. When I needed help with camera settings, help was readily available. I thought the snacks and surprise souvenir was a very nice touch too. The only downside is having no access to a toilet for several hours. At Aurora Village, you are pretty much on your own if you need help with camera settings. There are so many tourists there and not enough staff who specialize in photography to help them with photography questions. Also, no complimentary souvenir or food is included in the price (probably to encourage people to eat at the restaurant). I would recommend Aurora Village to people who are already confident with their aurora photography skills, or to people who want to view the aurora in a nice, comfortable atmosphere. If you know how to drive and already have a lot of winter driving experience, you might like to rent a car and drive around looking for the Northern Lights on your own. However, it would be difficult to locate the best viewing spots in the dark (there are many heavily forested areas), especially if you are not familiar with the Yellowknife area. We drove off the road sometimes during the aurora hunting tour in order to access some great viewing spots. -A thick winter coat. You can either rent one (many tour companies in Yellowknife rent winter clothing) or bring your own. I wore my own Moose Knuckles coat. – You need a camera that can shoot in manual mode. I used a Canon EOS Rebel T6i. -You will need a tripod in order to keep the camera steady while shooting the lights. Without one, your photos will probably turn out blurry, like the photos I took of the Northern Lights in Vik, Iceland when I forgot to bring my tripod. If the temperature is very cold, use gloves to handle the tripod. -Batteries tend to drain very quickly on extremely cold nights, so bring along an extra camera battery (or two) and keep them in the inner pocket of your coat. That way, they will stay warm from your body heat. -Before your trip, familiarize yourself with your equipment and settings. Practice setting up and dismantling your tripod. There’s nothing worse than fumbling around on a cold, dark night trying to figure out which button to press. -Set your camera to manual mode, then set the aperture to the widest setting (the smallest f-number). The smaller the f-number the more light the camera lens lets in. –Set the exposure between 8-15 seconds. The best settings will vary depending on how quickly the lights are moving across the sky. If the lights are bright and moving fast, you will need a shorter time, but if they are faint and slow then you will need a longer time. -At first, set your ISO speed somewhere between 800 and 3200. ISO is the level of sensitivity of your camera to available light. A high ISO speed can result in a grainy image, The settings you need will vary depending on the level of light in the sky, so before the Northern Lights appear, take a few test shots and experiment with your settings. For example, the settings needed on a dark night with no moonlight would be different from the ones needed on a moonlit night. –Shoot in RAW mode instead of JPEG to improve the quality of your pictures. You will also have more freedom when editing your photos (particularly the white balance). -Use a flashlight or headlamp to illuminate people or objects that you want to appear in the photo so that they won’t appear dark or shadowy. However, if there are other photographers nearby, be careful of where you shine your light or you may ruin their shots. -If you want to take photos of yourself easily, buy a remote shutter release. You can also use the self-timer setting on your camera (like I did for a few photos). -If you are taking photos during cold weather, wear a pair of fleece gloves with removable fingertips so that you won’t have to keep taking your gloves on and off. -Seeing the Northern Lights is a fantastic experience, but they won’t appear as vivid as they do in photos. To the human eye, they are a pale shade of green. The camera lens is more powerful than the human eye and can pick up colours and shades that we cannot see. -The Northern Lights will be different shades of green depending on your camera brand. For example, in the photos above, the aurora in the photos taken on my camera (Canon) are a paler shade of green than the photos taken by David’s camera (Nikon). -The lights could appear for only a few minutes, or they could dance for several hours! It really varies. I had heard of Yellowknife before, I actually even almost bought the tickets to it once, but while I was thinking if to go, the promotion expired 🙁 Too bad you did not see the auroras in the first two nights, when you had arrangements for them! But that’s the nature, and sometimes it takes time and patience. I myself live in the area where it is occasionally possible to see aurora, but it’s just a green flicker at the horizon and not these bright waves above your head. My dream is to see them this way as in your pictures 🙂 So I think Yellowknife might be one of the places I will visit in the future, especially since I used to watch Ice Road Truckers that was filmed there! It’s great that you have heard of Yellowknife before! 🙂 Yes, it is also famous for its Ice Road which is a very cool tourist attraction! I think not seeing the lights on the first two nights made me appreciate seeing them more once I finally did! The photos are amazing! you really had luck towards the end of your stay 😉 We´ve seen them last year in Finland but they were not as nice (we had full moon which made too much light and the activity was not all that strong anyway). Never heard of Yellowknife but i just googled where it is on the map – well, if I´m ever in Canada in the winter time, it´s on the list!! Thanks for your compliment on my photos! 🙂 I hope you will come to Canada during the winter someday – it’s a beautiful time of the year to visit. Wow! Your shots are just amazing! I’d never heard of Yellowknife but it’s obviously a great place to see the be lights! They are so high on my bucket list and I was thinking of visiting Iceland next year but I might have to change my plans ???? Love this! I always chase the aurora here in Saskatchewan but would love to get further north as they’re supposed to be brighter! In fact, there’s a big geomagnetic storm this weekend so I plan on going out to see them tonight too! I’m so glad you shared this. It’s nice to know there are other options for viewing this amazing spectacle. Wonderful tips about photographing the lights as well. Thank you! Thank you, Jamie. I’m glad you like the photography tips! Thank you! It certainly was an amazing experience. Your photos of Aurora Borealis are incredible! Wow! You definitely did a lot of Northern Lights viewings. I’ve only seen the lights in Oulu twice briefly… and it was so faint that it wasn’t so spectacular. I’d love to one day see a spectacular view of the Northern Lights. I had not heard of Yellow knife before. Your pictures are beyond amazing! I need to look into Yellowknife. I have always wanted to see the Northern Lights since i was a kid. Your pictures are breathtaking! Seems like I’ve been chasing auroras all my life and I still haven’t “experienced” it! No luck in Iceland and NZ, but maybe I’ll have better chances in Canada!!! Love that you also included tips on photographing it! it’s very important to know how to capture it! I’m glad you like the photography tips! Hi Kat, I had never heard of this place but YellowKnife is definitely on my mind now. The pictures are so amazing and thank you for all the helpful notes for planning the trip as well as photography. I will suggest this place to all my friends who have plans to see Northern Lights someday. Thank you, Manjulika. 🙂 I’m glad you liked the photos and tips. Northern lights are so high on my bucketlist! Thanks for this detailed post. I’ll be in Calgary this winter and I’m hoping to drive to Yellow knife and hope luck will be with me to see as much as you did. Have a nice time there! 🙂 I hope you see the northern lights. You really made me feel guilty 🙂 I am Canadian and I would love to see the Northern Lights but Iceland seems so much more exotic than your neighbour, you know? But your photos looked absolutely amazing and thank you so much for all of those tips, I might just need to take a train ride out there. Haha I am definitely guilty of wanting to explore other countries rather than Canada too! I have actually seen the Northern Lights in Iceland as well, but the lights I saw in Yellowknife lasted longer. Unfortunately, there’s no ViaRail train station in Yellowknife, so you can only fly in. Yes, seeing the lights really depends on the weather. I hope you have better luck next time! I have never been that north anywhere to see the northern lights but it is on my list for sure. I enjoyed reading your article. Very informative & cool pics. Absolutely fantastic pictures! I live in Canada and still haven’t gotten myself to Yellowknife but now I’m definitely going to need to try to make it happen sooner!